Thank goodness for the weekend and this is the perfect wishlist for a cute weekend outfit! I'm clearly not over my neutrals phase quite yet because I'm still craving everything in neutrals and these gorgeous mauve colors! I also started making this wishlist a little while ago and since then have actually purchased both these super cute jeans and the beaded clutch, so now I just need the rest of it! ;) The beauty of all these items is that everything is under $100- even the jeans! Who doesn't love a great (and inexpensive) outfit!! Obsessing over the ivory purse and brown fringe heels! Also, if your readers want to follow someone with similar style, check out www.gretahollar.com. Those jeans are on my list too! 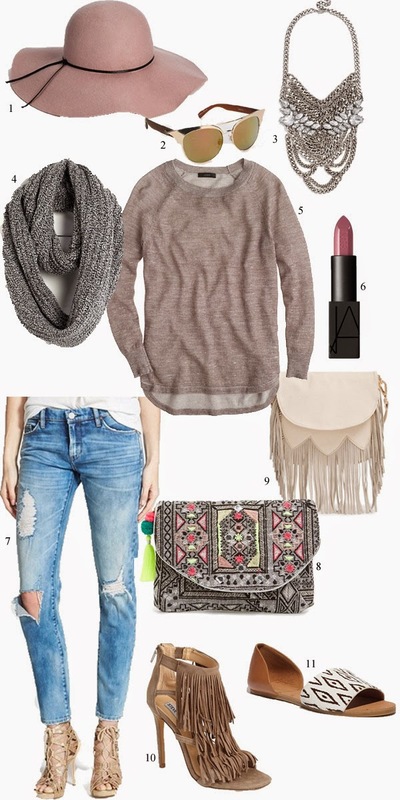 Love the lightweight sweater and fringed bag as well.